Have you ever put so much work into something and it failed? Have you ever missed a big opportunity? Have you ever been in a situation where it looks like you’re the dumbest person on the planet? I’ve been there, and I know it hurts. It hurts to throw yourself into something, and it doesn’t work out. It hurts when denied an opportunity you know you’re qualified for, and other less-qualified people got selected. It hurts to see everyone else progressing, but you’re still stagnant. Many people, when they experience failure, start thinking that is their destiny. They buy into what Les Brown calls “the never lies”: I’m never going to amount to anything; I’ll never be happy. Their self-image gets destroyed by their experience and life becomes meaningless. They live day-to-day and every waking moment is mental torture. They’re like the woman in the book, The Alchemist, every day is just the same and there’s nothing to hope for. If you’re going through a failure situation, I have good news for you: There’s a science-based formula for reinventing yourself! I know it works because it worked on me. While I cannot promise you fame or fortune, I can guarantee, however, that if you apply these principles, you will not only reinvent yourself, but you will be rightly positioned to do remarkable things in life! “Success and prosperity are nothing more than a way of thinking. We need to think differently.” – Strive Masiyiwa, Founder and Executive Chairman of Econet Group. Nutritionists and psychotherapists have found several reasons why we need to occasionally detoxify our bodies: To remove toxins from the body, prevent chronic diseases, lose weight, enhance the function of our immune system, and so on. Likewise, we must occasionally detox our minds. The problem with many people is that their mind has accumulated several layers of negative silos from their experiences of failure. They’re afraid of taking risks because they think they will never make it. Their mind prevents them from taking actions it links with pain and pushes them to the ones it links with pleasure. This is what experts call associative conditioning. If this is you, take heart, you can break that cycle from today! Dr. Carol Dweck, Professor of Psychology at Stanford University developed a groundbreaking learning theory called a growth mindset. It’s a sharp deviation from the common belief that a person’s talents are cast in stone. 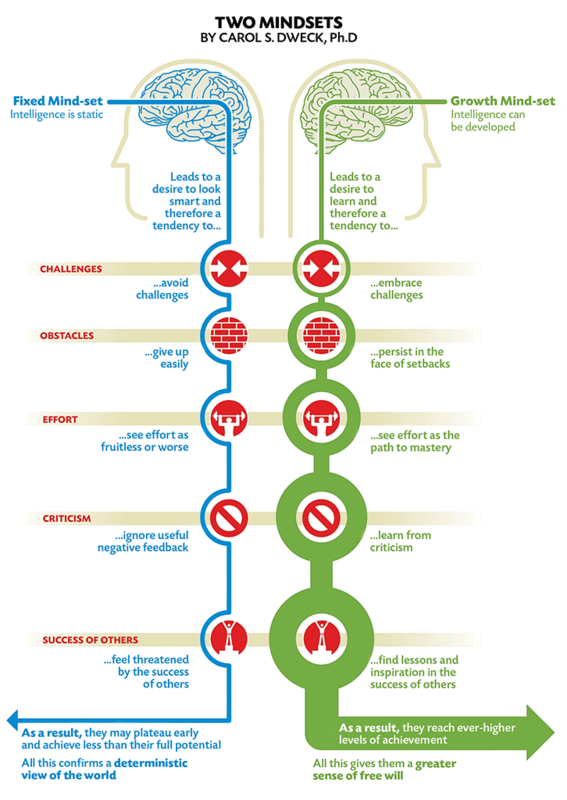 Growth mindset is a concept that revolves around the belief that you can improve intelligence, ability, and performance. It is based on the belief that your basic qualities are things you can cultivate through your efforts. In other words, failure is not final, it can be conquered with efforts. Is your life on track or are you drifting? Are you feeling stuck and powerless? Do you feel overwhelmed? The good news is: Whatever damage negative, limiting thoughts have done in your life can be undone by you detoxifying your mind. Hence, you can begin, now, to fill your mind with positivity. You can begin to believe that things always go well with you. You can begin to believe that you’re a success. You can begin to expect amazing things to happen – and research says the universe will correspond to the nature of your song! Mind over matter? Yes, but that’s not all. You have to take actions that resonate with your new self-image. Create a picture of who you want to be and propel your life in that direction through massive action (we’d take a deep dive into this in point 2). When you believe something, you commit to it. If you say you believe something but your actions do not show it, you do not believe. Some people chase too many things at the same time. Their attention and energy strains between several options. In his book Essentialism: The Disciplined Pursuit of Less, Greg McKeown explains that, for centuries, that word “priority” was singular. It meant the first thing. Before somewhere around the 20th century, when the plural “priorities” magically surfaced, there can only be one first thing. Today, a lot of us are choked with several first things that we’re stumbling. What have you achieved in the past two years of your business, career or life? What are the failures you’ve experienced in that process? Is there a correlation between your lack of focus in your success or failed efforts? What is the one thing that if achieved will move your life further? What has been a drag to your life that you need to let go of? When you’re done ferreting out answers to these questions, then it’s time to commit. If you’re a business owner, you’d probably discover that your lack of focus and strategy is sapping your energy. In other words, you’re a control freak and it’s killing your productivity. It might make sense to delegate or outsource the activities that do not rank within your strengths and specialize in those you excel in. If you’re a student, you may realize that you’re spending too much time on other stuff instead of your studies. It’s quite easy to slack at school these days. The truth is: Education is still prime, regardless of your aspirations. See, success is not accidental. Being a “jack of all trade or gonna-doer” does not translate to success either. It makes us lousy because, as Tony Elumelu said, you can have it all but not at the same time. Sometimes, the easiest way to make progress is by not doing more. Evaluate your life. Pinpoint where your time and efforts are going, set your focus on a specific target, seek mentor support in guiding your path, and, commit to a course of action. Why is this so? Why is there a high chance for us to follow through on a commitment to someone else than to ourselves? The reason is simple: We’re far more likely to lie to and let down ourselves than someone we trust and respect. Believe it or not, accountability works – every, single, time. Consequently, when it comes to choosing your inner circle, you need people who hold you to high standards. You need people who are transformational and self-motivated. This is what I call “A-Game” partners. Your “A-Game” partners are innovators – they are continually pushing boundaries and breaking molds. They understand they’re responsible for their lives and results hence they take action in creating the outcomes they want. One of my “A-Game” partners is a young woman I met a few years ago. Although we come from different backgrounds, we share similar worldviews. To her, the world is binary: If you’re not winning, you’re losing. If you don’t know something, learn it. Her unique insights and simple approach to life are remarkable. We intrinsically challenge each other to grow further and outdo our pasts. Do you have an “A-Game” partner? Do you have someone to whom you can peel off your life without the fear of being judged or criticized? Are you carefully choosing your network or are you tiptoeing around with losers? If you don’t have good people around you, find some. And, don’t just find one, create an army. Immerse yourself in a network of people who inspire you to become better. Remember: Relationships thrive when each party is pulling along. So, don’t just take, give back. If you’ve experienced failure or missed several opportunities, this is the time to rewrite your story. Be patient with yourself as you practice the following three steps: 1) detox your mind, 2) define your priority, and 3) create an “A-Game” partners. Being a failure is a state of the mind. Don’t confuse your results with who you are. Every failed attempt moves you further. Another thing I want you to remember is that just because someone else is prospering doesn’t make you a failure – focus on your own journey. Invest in yourself, improve your worth, become inspiring. And, the next time an opportunity comes knocking, you’d be ready! If you enjoyed reading this article, consider sharing it so that others can find it! To get more inspiring contents like this in your inbox subscribe to our mailing list. Tom-Chris Emewulu is the Founder & President of SFAN. He is an education enthusiast, entrepreneurship and career coach, a consultant at Mastercard Foundation, Seedstars Ambassador for Ghana, and an aspiring Venture Capitalist. SFAN is an education company that unlocks the potentials of young people through EPIC events and a 6-weeks talent accelerator program called Readyforwork. With these tools, young people receive personalized, actionable and coach support to launch their businesses or careers. Get our bi-weekly email of inspiration, career and business insights.